There are over 100 reasons why your Swiss or American pocketwatch won't run. One or more of it's 200 parts may be broken, rusted, miscalibrated, unoriginal, previously improperly serviced, under lubricated or just plain tired. Between 1880 and 1960, 300 million pocket and locket watches for men and women were produced from nearly 1300 different movement models. If your Swiss or American watch falls between these years, and it wants to run again, you've found the right page. Many of the vintage pocket watches I restore are already 70 years old, and are in need of parts do to wear, fatigue, or breakage. Each watch depending on age, model, style, original quality, usage, previous repairs, parts availability, and overall care, demands very individual care. Each watch that I authorize to be sent to me for restoration will be fully and painstakingly serviced using authentic replacement parts if necessary. All work and parts are guaranteed for one year. Most mechanical watch restorations are conducted in 3 blocks of time ranging from an hour to two each. Upon completion, every mechanical and artistic consideration has been a applied. Your restored watch is ready again for daily use, and in most cases won't need it's next servicing for up to 15 years. In most cases, a full restoration can be completed and returned to you by insured mail in two to three weeks time. The following pricing is a guideline of what your pocket watch may need to again become a beautiful and dependable daily companion. The current condition of your pocket watch will determine all. If your watch isn't in poor condition as most 70 year old watches are, expect to pay less. Every watch I accept for restoration is fully disassembled for servicing. Every case and dial are serviced to look their best. Every crystal that is able to be polished- is. Prices don't include return shipping. Shipping, special packaging and insurance cost is normally $30 ($2000 insurance). Below restoration prices include full servicing of movement, case, dial and crystal to it's most functional and presentable condition possible. All replacement parts and labor guaranteed for one year. Every mechanical and artistic aspect of your watch will be addressed. Please know that your family heirlooom watch will be in very safe and competent hands. It is my goal to become trusted watchmaker for many years to come. When you're further interested in having me pass along my impressions and recommendations about the servicing and repair of your American or Swiss pocket watch, I look forward to learning more about your watch and specifically it's current condition. It would be good for me to know how long it's been since it last performed dependably. Is it missing any parts? Can you set it's time? Will it's winding crown turn? Do you know if it's stoppage was due to it being dropped or immersed in water? When it's fully wound, will it tick at all? A clear detailed description will allow me to make a very close estimate it it's repair costs. The cause of most erratic time keeping in a mechanical watch is attributed to it's small amount of critical internal lubrication having evaporated. Dirt mixing with this perfectly placed high-grade lubrication creates a sludge that can bring a watch to a slow halt. The only way to remedy this stoppage is to disassemble the watch in it's entirety, clean every part, reassemble, lubricate and calibrate it. Such a servicing - based on the type and style of watch - will only need to be undertaken every 5 to 20 years. Other times when an internal part has broken or become too worn to properly function, a watch will halt without notice. A full disassembly and cleaning of the watch and replacement of the failed part will return your watch back to faithful function. If such a parts replacement required, I've amassed an archive of authentic American and Swiss replacement parts. 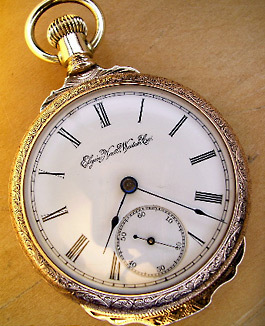 The pocket watches that I will consider for restoration are the factories of: Ball, Columbus Watch Company, Elgin, Hamilton, Hampden, E. Howard, Howard Watch Co., Illinois, Peoria Watch co., Rockford, Seth Thomas, South Bend, United States Watch Co., U.S. Watch Co., and Waltham. Mosart Watch Co. New York Watch Co.
Ingersol Waterbury Columbus Watch Co.